Here’s what you probably know about Joey Bosa: He was the only first-round draft pick who held out all summer. And what was that about, again? Not money, but how the money was going to be distributed or something like that? Anyway, it got sorted out because it always does. And so he joined the Chargers at the end of August, but a hamstring injury promptly put him back out of sight and, this time, out of mind. The injury eventually healed and Bosa made his NFL debut in Week 5. It was a regionally televised game at Oakland—one that, let’s be honest, you maybe saw about a dozen snaps of on the Red Zone channel. Since then you’ve heard here and there that Bosa has looked good, great even. Good for him, you’ve thought. Bosa’s Chargers, meanwhile, are barely on the outer fringe of playoff contention. And so, unless you’re a Bolts fan, you probably haven’t paid much attention to this year’s No. 3 pick. Which is fine; that’s how it goes. But you’ll soon look back on this period as that strange time when Bosa was in the NFL but not yet a household name. You’ll think about it the same way you now think about J.J. Watt’s 2011 season, before he became J.J. Watt. Bosa sacks Falcons QB Matt Ryan in late October. 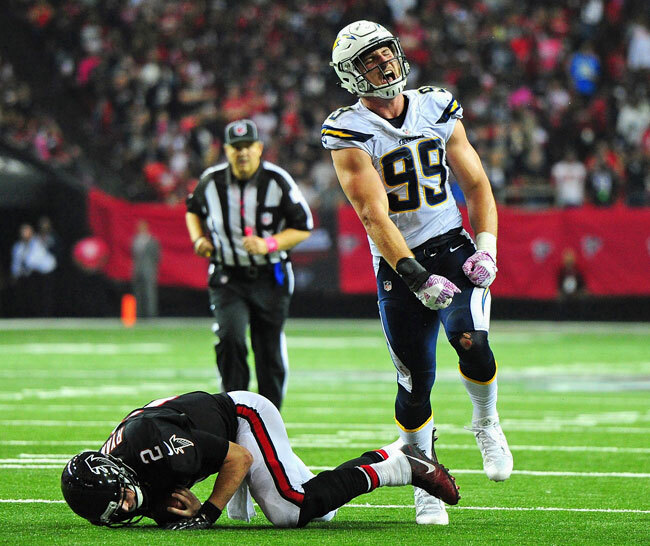 Like Watt, who will be regarded as football’s best defensive player as soon as his back is healthy again, Bosa’s primary role is strongside defensive end. Not many years ago, this was a nondescript position. The strong side naturally brings about more double-teams (primarily the tight end helping an offensive tackle), so defenses didn’t put their best players there, just their biggest. But Watt transcended the position, presenting offenses with the dilemma of what to do when there’s a defender who can consistently destroy double-teams. 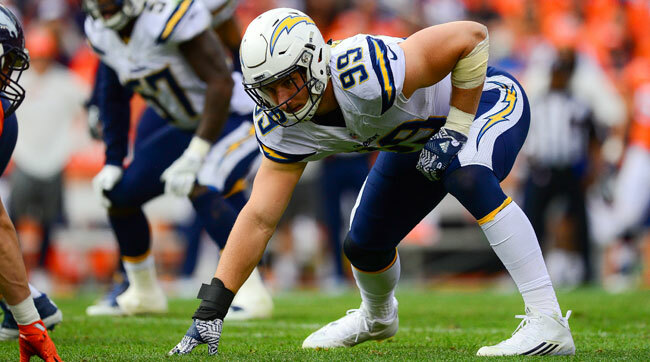 Two weeks ago against Tennessee, one of those injuries forced Bosa to play outside linebacker in San Diego’s base 3-4, adding a position to the rookie’s résumé that has never been on Watt’s. Bosa is still most comfortable playing with his hand on the ground, but is adjusting well to other positions. “I’m still getting used to standing up,” Bosa says. “I’d say I’m still more comfortable with my hand in the ground, but it’s early. I’ve definitely had better vision standing up, and you get to see the whole offense—any shifts or motion at the last second.” Bosa is saying this over the phone after a November practice. In the background are flutters of voices and clanging. “Some of the guys are messing with me,” he says apologetically. Asked who, he replies “Tenny [Palepoi], the worst D-lineman we have. He came in telling me to tell you he’s the best.” The background laughter crescendos. In football’s alpha society, popularity comes easier with talent. And remember, this talent is still being served fairly raw. Even by rookie standards, Bosa has had very little opportunity to hone his craft. The Chargers have been rocked by injuries. They’ve blown leads and lost close games. Every other team in their division has seven wins. And with San Diego voters having rejected a new stadium proposal earlier this month, it’s unknown where this team will reside next year. Equations like this are how coaching staffs and rosters get overhauled, even when they shouldn’t. But on the happier side, whatever rough waters still lie ahead, the Charger will at least be navigating them with the NFL’s best young defensive player. And it might not be long before the qualifier young is removed from that label.